Huruma, is a residential area located in the northeast of Nairobi. Huruma is composed of mixed used buildings and structures, however, it is still classified as an informal settlement – a village that has no official standing where people live in constant threat of eviction. Approximately close to 60% of Nairobi’s population lives in such areas as Huruma, occupying only 5.84% of residential land in the city. Children living in Nairobi’s informal settlements face numerous challenges which includes, trying to cheat natural transition, most kids living in informal slums such as Huruma, are forced by circumstances to grow up fast in order to fend for themselves and their families. Children as young as 10 years old often fetch water, watch over younger siblings, and step into the role of productive contributors to help the household make ends meet. The cost of 20 liters of water is Ksh. 3, and this water is not fit for consumption, frequently causing diseases such as typhoid or cholera. Bombarded with these responsibilities, they are forced to cut short their schooling, which drastically affects their performance and skills that education may affords. This vicious cycle of poverty is one of the biggest issues in development, and necessitates significant creativity to problem solving. The average size of a shack in Huruma is about 10m by 10m. These shacks, that may house up to 6 people or more, many having to sleep on the floor, are usually made of mud and dirt, sometimes reinforced with concrete, with tin roofs and concrete or dirt floor. As a result of the congestion in the house, which serves everything from kitchen, sitting, bedroom and also study room. There are no basic sanitation systems, sewers or waste disposal systems. At night the streets and alleys of Huruma is often busy, small 24 hour economy it might be referred to. A spot check reveals that almost every high rise building has a bar on the ground floor, while families rent out living rooms on the top floors of the buildings run by families living. In such an environment alcohol is cheap. Alcohol is a huge problem in Huruma. And prostitution is linked in with it. For many women it’s the only way they have to make quick money. Poverty and the thread of addiction and prostitution are closely interwoven. These are just but the few traps of urban poor that the invisible children living in slums have had to deal with. In trying to address this problem, Kambimoto community in Huruma have entered into a partnership with School of Hope to build a community library of which is often very busy and useful during evening hours for the children who can spare a few hours to study. The facility accommodates about 35 kids every evening to do their homework and also revise for their school exams. School of Hope is a program by Challenge aid, an American NGO of which it partners with local communities to provide education facilities in low income communities. There are several Schools of Hope in different areas. Mashimoni, Jangwani, Gitathuru, Kiamutysya Majengo and Madoya are also setting up libraries in the settlements. The idea about the Kambimoto Library was an Idea brought about by the children from the slums, since most of them lack adequate access to a conducive and serene environment to study, in some cases, parents working outside Huruma don’t head back home after work, because their houses are overcrowded, and very poorly equipped they prefer to stay at the local pubs and drink away the stress of the day. They stagger home late at night when their kids are already sleeping. Hence paying little attention to their kids’ education. The Kambimoto community then provided the space and the School of Hope renovated the community social hall to accommodate the library and also furnished it with books. The programme has also introduced several sports games such as Football (Slum soccer), Rugby and cricket. So far cricket has been widely embraced by the children as a new sport in the settlement. 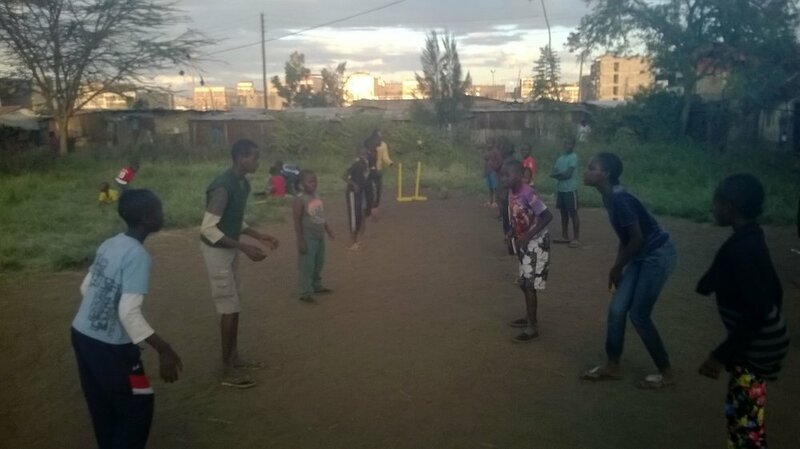 Some of the Kids enjoying a game of cricket after school. Food insecurity and hunger is also one of the other major problems pointed out by the community. Most children living in this slum do not even get one meal a day and there are many cases of malnutrition. These libraries serve only a small fraction of the population of this area. Other parents have to struggle to send their children to the informal schools, which are privately run.”As a result, about 30 per cent of children in this informal settlement don’t go to school at all. Where available, urban data reveal wide disparities in children’s rates of access to education, survival and nutritional status, the result of unequal access to services. Yet even this information is often hard to find. Further data and analysis are needed to address the needs of these impoverished and excluded urban children influence allocation of resources to enable children living in informal settlements access education and learning facilities, hence giving equal opportunities to all children.